We’re rolling out the red carpet for the December 1st release of Microsoft Dynamics GP 2018. It was indeed a glorious day for Dynamics GP customers. New releases always come with a host of new features that put a smile on everyone’s face. GP 2018 introduces the next evolution of Comprehensive Doc Attach on most master record windows, inquiry windows and transaction entry windows. 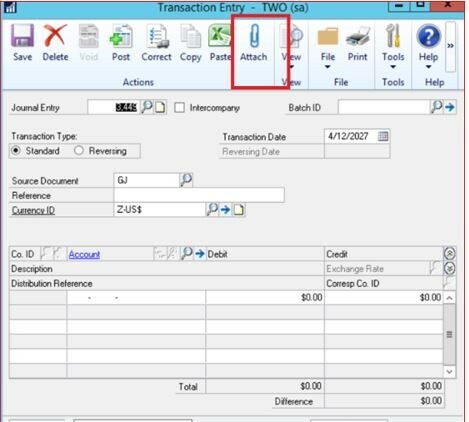 Specifically, the Document Attach icon has been added to the Receivables Transaction Entry window and the Transaction Entry (General Ledger) window. And there’s more! Because the Document Attach icon has also been added to the following windows: Employee Inquiry, I-9 Form, (Fixed) Asset Inquiry, Vendor Inquiry, Customer Inquiry, Project Inquiry, and PA Project Inquiry. GP 2018 improves the user experience by giving users easier and faster ways to get to and find the data they are looking for to make decisions based off the information stored in Microsoft Dynamics GP. The Financials and HR/Payroll experience in Microsoft Dynamics GP 2018 has also been optimized. With the release of Microsoft Dynamics GP 2018, the capabilities of Workflow have been extended. In addition to new workflows such as GL Account and Purchase Invoice, workflow capabilities like copy step and reminder emails have been added. The Power Suite now supports Paging and Filtering in OData Services, Support OData V4 and finally, what users have all been waiting for, the GP Power BI Content Pack! Stay tuned for even more news about Microsoft Dynamics GP 2018 because this is the just the tip of the iceberg. Got questions? Contact us for the answers. You can also contact me, Laura Peters, at lep@intlsoftwaresystems.com, at my office 714.379.0545, or on my cell at 714.264.4250. We’re on the Web at www.intlsoftwaresystems.com.